With seating for nine passengers, 1959 Plymouth Custom Suburban four-door wagon sold for $3,775 f.o.b. Windsor and weighed in at 3,805 pounds. It was imported from the United States. The boys at Chrysler Canada were ecstatic as the 1957 model season drew to a close. 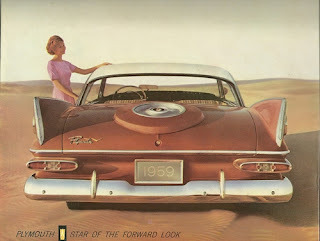 The “Forward Look” cars from Plymouth, Dodge, DeSoto, Chrysler and Imperial had been a huge hit with the public. Production for the corporation hit 99,698 units, an all time high. Plymouth production alone had reached 30,085 units, accounting for nearly one out of every three cars built in the Windsor plant. Everyone, from the 12,000 factory workers to the 1,200 dealers looked forward to more of the same high-energy excitement in 1958. While designers gave tasteful updates to Plymouth, the style boys at Ford and Chevrolet stole the day with very sleek looking new models, making last year's sizzling hot Plymouth look suddenly dated. 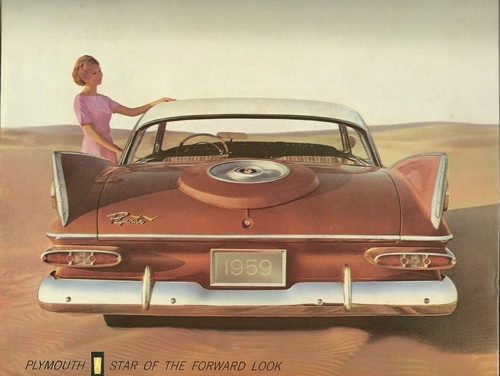 The fickle public shunned the entire 1958 Plymouth lineup. With few orders coming in, the workforce was slashed to 3,000 workers. 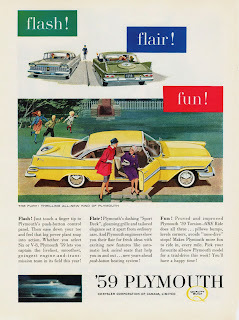 Advertising for the 1958 Plymouth was bold if ineffective in generating sales. Head office did not sit idly by while sales evaporated into the ozone layer. The sales organization was given a complete overhaul. Six new zone managers were put in to place and two sales managerships were selected to give better attention to the needs of dealers in Atlantic Canada and western provinces. If there was a silver lining to the storm cloud, marketing discovered that those who did buy a Plymouth loaded it down with an average of $431 worth of accessories. A full 65.6% of buyers bought the PowerFlite two-speed or the three-speed Push-Button TorqueFlite automatic transmission. Long touted by the RCMP, the Ontario Provincial Police and the Quebec Provincial Police as a safety feature, 40.4% of Canadians ordered the Safety-Sure Power Brakes. That figure was much higher than the 15.1% of Americans who purchased the same option. The third most popular accessory added onto Chryco cars was the Constant Control Full-Time Power Steering, purchased by 20.5% of consumers. Imported from the United States, the posh 1959 Plymouth Sport Fury convertible and two-door hardtop sold for $4,103 and $3,841 respectively, f.o.b. Windsor. 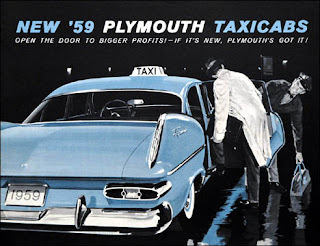 For its third year of the body cycle, designers gave Plymouth an attractive restyle for 1959. The dual headlight cowl was kissed with a coy sweetheart dip. The clean, eggcrate grille split neatly at the centre to showcase a chromium rocket emblem on a golden bed. Trim was reworked. Fins towered higher and now canted outward. Customers could choose from 22 different models, ranging in price from $3,305 to $3,805. The Savoy series was the value leader. A pair of modestly appointed Club Sedans and four-door sedans was available with the 250-cubic inch, 135-horsepower six-cylinder engine as standard equipment. The low-buck entry Plymouths could be upgraded to the 313-cubic inch, 225-horsepower V-8 for an extra $140. More nicely trimmed was the Belevedere family. The Club Coupe and four-door sedan were joined by a two-door Sport Coupe in six-cylinder form. A six-passenger convertible coupe was offered but only with the 318-cubic inch, 230-horsepower V-8 engine. The imported ragtop listed for $3,580, f.o.b. Windsor. 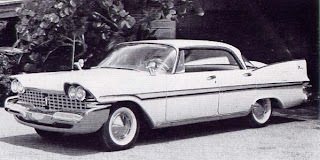 The 1959 Plymouth Fury four-door hardtop listed for $3,379 f.o.b. Windsor, Ontario and tipped the scales at 3,510 pounds. Wisdom of the day was that a car should cost under a dollar a pound for true value. Fury was the fastest and most fabulous of the Plymouth clan. The base mill installed under the hoods of these beauties was the 313-cubic inch, 235-horsepower V-8. The luxurious four-door sedan was built in Windsor, while the two- and four-door hardtops were imported from the States. In a bid to add a few sales to a faltering model year, a Sport Fury was introduced. These rakish two- and four-door hardtops came equipped with monstrous 361-cubic inch V-8s shoehorned into their engine bays. With 290 horses to command, no doubt Queen Jezebel would have chosen to race them through the streets of Jerusalem. Plymouth offered six wagons. “First in features, first in fun,” shrilled the headline along with the not-so-modest announcement that the Plymouth wagon was the “biggest and brawniest in its field.” It certainly had plenty of payload area; interiors boasted more than 100 cubic feet of usable space. Locating the spare tire behind the rear fender and making it accessible from the outside of the car was the secret behind that cavernous cargo area. Plymouth’s 1959 instrument panel boasted a Control Centre, the latest advance in Push-Button Driving. The crème-de-la-crème in Plymouth’s wagon train was the four-door Custom Suburban; the sole model to seat nine-passengers. Its $3,775 price tag made it the third priciest Plymouth on the dealer’s lot. With the Fury 318-cubic inch V-8 mill as standard equipment, it was advertised as perfect for the car pool or the swimming pool and promised luxurious comfort for all who jumped in. The imported wagon boasted an electrically operated tailgate window as standard equipment. A single Custom Suburban was next. Seating six, this domestically built four-door wagon moved courtesy of the 225-horsepower 318-cubic inch V-8 engine as standard equipment. Before add-ons, its list price was $3,692. Last but by no means least, the most economical Plymouths were the two-door and four-door Suburbans, delivering beauty on a budget. The two-door model featured one-third/two-third seat splits to facilitate ease of entry and exit for passengers in the rear. It sold for $3,127 when equipped with the six-cylinder mill and $3,268 with the 313 V-8 stuffed under the hood. The base Suburbans were attractive workhorses and marketing made sure that they was seen by the do-it-yourself” crowd. Advertising depicted the rugged vehicle at work on a construction site. 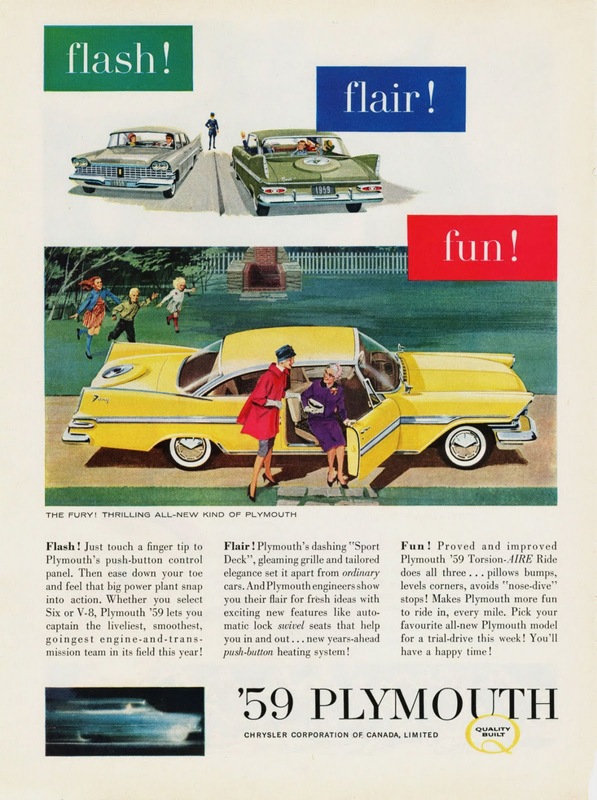 All the beauty and hype in the world didn’t help Plymouth in 1959. Head office watched with dismay as sales sank, again. 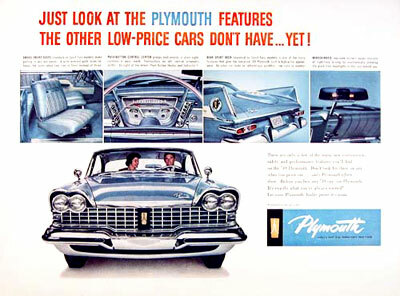 With model year production of only 19,134 units and calendar year sales of 15,760 units, Plymouth slid from seventh to ninth place in the domestic market. Plymouths were popular 'working girls' often used as taxi cabs and police cars. 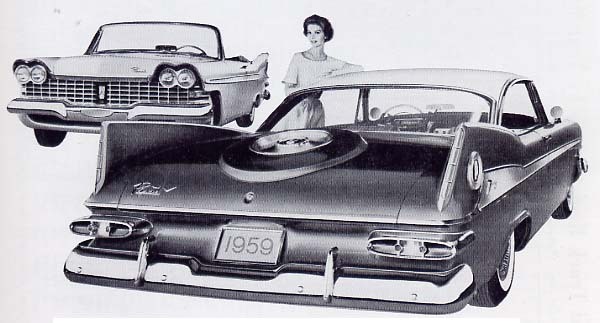 The real problem was that consumers were no longer impressed with scads of V-8 power, bigger fins and more chrome. They had no need for longer, wider, lower heavier vehicles. What they shopped for were small, economical cars that cost little to buy, little to maintain. Basic transportation delivered them from Point A to Point B with a minimum of fuss was what Canadians wanted. That was the reason why Vauxhall and Volkswagen surpassed Plymouth in sales. Chrysler officials could read too, and had hedged its corporate bets by purchasing 25 percent of Simca. The captive import from France sold 4,051 units in its first year on the Canadian market. 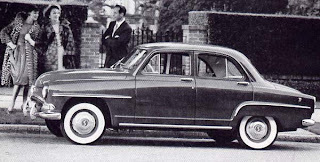 Simca, imported from Paris, was the littlest Chrysler Canada offering in 1959. The four-door, five-passenger Deluxe sedan listed for $1,845 f.o.b. at the Montreal port of entry. The 118,513 imports purchased by consumers in 1959 amounted to 23.8 percent of the entire new car market. That figure was more than double Chrysler Canada’s entire output for the year. Plymouth might be down but it was far from out. It would return to fight another day. Visit my old car website at: The Oilspot Eh! Copyright James C. Mays 2005 All rights reserved.